Keep ahead of the game and stay flexible with Fibre400. innoTel’s Fibre400 service, great for small to medium businesses who require high-bandwidth connectivity, delivers a symmetrical 400Mbps fibre-optic connection to your premises, which includes unlimited Internet data and offers flexible configuration options giving you control over your connectivity and choose how your 400Mbps Fibre service is used. Fibre400 is the most affordable per Mbps service of its kind in the industry with flexible pricing and contract terms. Allocate all 400Mbps of your service to a single Internet service with Unlimited data, or divide the bandwidth between up to 4 different services . All Fibre400 services come with an Unlimited Internet data plan, static IP Address to compliment Enterprise grade connectivity. Multi-site customers can add Fibre400 as part of a Private Network MPLS VPN mix. Connect two sites with high-bandwidth and performance connectivity? Fibre400 offers secure, business grade connectivity between 2 customer premises. Add VoIP / Sip Trunking services to your package with dedicated connectivity for voice, improving your communication experience. Moving to the Cloud? 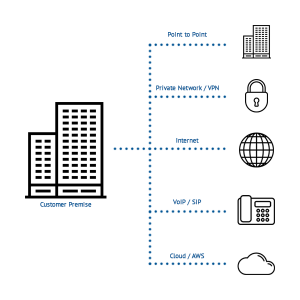 Fibre400 has direct, private connectivity to Amazon Web Service via AWS Direct Connect that offers lower latency, improved performance and enterprise grade connectivity to Amazon Web Services (AWS). This service is limited to serviced (lit) buildings within major CBD areas in Australia. A service qualification is required to confirmation your premises has access to this product. innoTel provide a Network Termination Unit (NTU) with four (4) customer facing 10/100/1000-BASE-T ports as part of the solution. In addition to the NTU, customers are required to purchase/supply their own Ethernet Router capable of supporting 400Mbps throughput. InnoTel can supply a range of routers to suit as part of your package, including Managed Router options.